Videos, pictures, slideshows and articles about many fascinating countries. Travel the world from the comfort of your own home. View more presentations from DR ROM. View more presentations from Constantine Karatzogiannis. View more presentations from Roelof v d Berg. View more presentations from 8manu. View more presentations from guest087332. View more presentations from Ivy Cheng. View more presentations from Oscar Luiz Neto. The Taj Mahal is just a three hour trip from New Delhi, India. It is one of the most attractive and famous tourist destinations in India. It stands on the bank of river Jamuna at Agra, in the state of Uttar Pradesh. The Taj Mahal was built by the fifth Mughal emperor, Shah Jahan in 1631 in the memory of his second wife, Arjumand Banu who was later known as Mumtaz Mahal, (The word Mumtaz Mahal means the Distinguished of the Palace). The dome rests on a huge white marble terrace rising from a high red sandstone base (186x186 feet) and is flanked by four tapering minarets. Shahjahan consulted experts from the Middle East and Europe as he planned the construction project. It took twenty thousand people over twenty-two years to build. 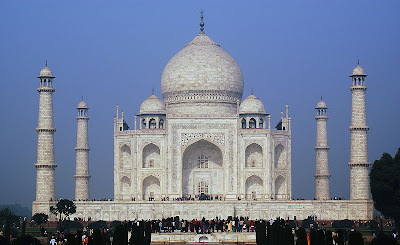 Three names come up as designers of the Taj Mahal, Geronimo Veroneo an Italian, silversmith Austin de Bordeaux a Frenchman and Ustad Ahmad a Persian Engineer. It is said that materials were collected from many parts of the world, including the hills of Markana, Chinese Turkestan, Tibet, Burma, Afghanistan, Egypt and the Himalayas. The Taj Mahal is said to express the different moods of a woman. It looks pinkish in the morning, milky white in the evening and golden when the moon shines. It remains an unmissable site for anyone who visits India.